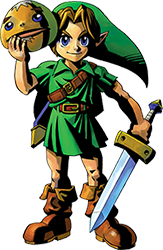 After the events of Ocarina of Time, Link leaves Hyrule in search of Navi, entering the Lost Woods where the Skull Kid ambushes Link and steals the Ocarina of Time as well as Epona. Chasing after the Skull Kid, Link falls down into a world called Termina and is transformed into a Deku Scrub by the Skull Kid. 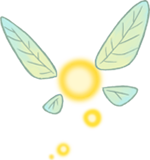 Tatl is the fairy companion of Link in Majora's Mask. Her and her brother are friends of the Skull Kid, but are separated when Skull Kid ambushes Link and transforms him into a Deku Scrub. Tatl decides that she must go with Link to help find her brother and to prevent the Skull Kid from destroying Termina. 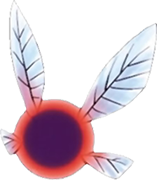 Tael is a male fairy and the brother of Tatl. After the events at the beginning of the game, Tael is only seen at the top of the clock tower after Midnight on the final day and gives clues to Link on how to stop the Skull Kid from destroying the world. 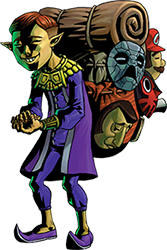 The Skull Kid, most likely the same one from Ocarina of Time, has a habit of playing tricks of the residents of Termina. Due to this, he is out casted and finds comfort when Tael and Tatl encounter him during a cold and rainy night. He becomes a powerful sorcerer after becoming possessed by the Majora's Mask that he stole off the Happy Mask Salesman. Majora's Mask is the primary antagonist of Majora's Mask. The Happy Mask Salesman will task Link with retrieving the Mask from the Skull Kid due to his fear of the impending doom that will befall Termina if Link fails. 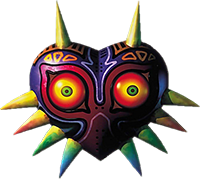 The Mask, originally used by an Ancient Tribe for its bewitching rituals, was originally sealed away to prevent a great destruction to Termina. The mask summons the Moon to directly crash into Termina, and Link must find a way to stop it from happening. The Happy Mask Salesman continues his journey from Ocarina of Time to acquire more masks, when he is ambushed by the Skull Kid, Tatl and Tael. The Skull Kid steals the Majora's Mask from the Happy Mask Salesman before he can wake up, and the Happy Mask Salesman begs Link to retrieve the mask before it's evil power can destroy the world. 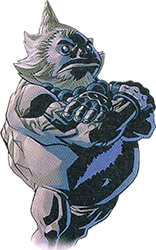 Darmani was a renowned Goron Hero, who was considered the best warrior of the Goron Tribe. When investigating what was causing the blizzard on Snowhead Mountain, Darmani was knocked off the path and fell to his demise. If Link plays the Song of Healing to his ghost, Darmani will leave Link with his power in the form of the Goron Mask. Mikau was the lead guitarist of the Zora band and was close with the lead singer, Lulu. Mikau is killed after he attempts to retrieve Lulu's eggs from the Pirate's Fortress but fails in doing so. If Link drags his dying body to the shore and plays the Song of Healing to him, Mikau will leave behind the Zora's Mask so that Link can retrieve Lulu's eggs. Anju and her mother own the Stock Pot Inn in Clock Town, and Anju is the fiancé of Kafei although Kafei disappears a few days before the wedding. Anju and Kafei are involved in the longest of the sidequests in Majora's Mask, and it takes all three days to complete. Kafei is the fiancé of Anju, and is transformed back into a kid by the possessed Skull Kid. When Kafei tries to go to the Great Fairy about his plight, Sakon steals Kafei's wedding mask. Distraught, Kafei goes into hiding near the Laundry Pool and disguises himself with a Keaton Mask. Tingle is a "fairy" that sells maps to Link, although Link will need to shoot Tingle out of the air to be able to buy them. Tingle is a 35 year old man, who was disowned by his father due to his obsession with fairies. Although Tingle is found in many Zelda games now, this was the first occurrence of the character. The Fierce Deity is the final transformation that Link can transform into, and is acquired by trading all the masks in the game to the four moon children inside the moon. 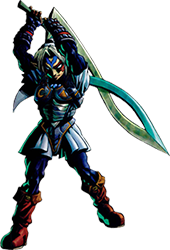 The Fierce Deity form is much stronger and has much larger range than Link is able to have, although he is unable to use a shield due to wielding a large two handed sword. 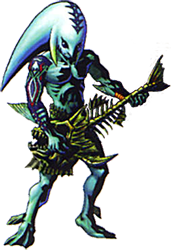 The Fierce Deity form can only be used in the final boss battle, except in Majora's Mask 3D where it can also be used in the fishing holes.